A simple trip out to a park or beach can become a hectic activity; from the planning to the packing of all essentials such as the coolers, chairs, towels, umbrellas and even the floats! This struggle can take a turn for the worst when the trip includes children and pets, as their addition will result in even more gear to be packed. However, with the best beach wagon handy, your summer vacation wouldn’t have to look so gloomy and hectic. These units are designed after extensive research has been carried out, to help you carry all these items and even more, in a single trip. Say goodbye to backaches and multiple tours with our list of recommendations for the best beach wagons below! All products listed below are our favorites as a team, mainly because they are durable, affordable, and also offer the highest performance as compared to products from other manufacturers. Have a look! Who knows, you might find the unit you’ve been searching for. The growth of the first brand on our list, MAC Sports, has always been governed by the brand’s continuous quest for innovation and unparalleled quality. These features have helped in the steady evolution of this brand into one of the leading producers and distributors of collapsible furniture all around the world. Since their inception, MAC sports has provided customers with excellently performing products and has since branched out into the manufacture of other products such as juvenile and garden furniture. The MAC Sports Collapsible Folding Outdoor Utility Wagon is a member of their product family, and by association, it is one of their best products to ever exist on the market. There are numerous functional features possessed by the MAC Sports beach cartwheels and these features ensure that it delivers nothing but the best in function and performance. An adjustable handle is included in the design of all MAC utility wagons for easy transportation of the cart from one place to the other, no matter the kind of terrain. It also enables you to keep your beverages secure at all times by providing users with two mesh cup holders. This utility wagon is exceptionally durable, and this is ensured through its sturdy construction. The use of a durable 600 denier fabric and a heavy duty frame construction allows this wagon to withstand any form of pressure it’s subjected to. It is also able to carry gear weighing up to 150 pounds with no issue. With such a capacity, your consecutive trips to and from your car for your travel gear will be cut in half! This outdoor beach caddy from MAC sports has a lot of room for all your items. It is considered an excellent investment as you receive the biggest bang for your buck. With a maximum capacity of 35.5″ x 20″ x 22.5″, this utility wagon can be folded out to its full size for extra storage, and this process doesn’t require the use of any additional tool or assembling method. The large interior of this wagon can be compacted into a mere 8 inches in seconds. The compact design of this utility wagon from MAC SPORTS is one of the contributing factors to its popularity across the globe. 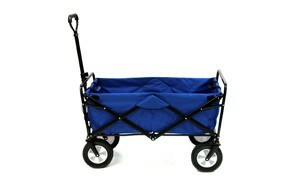 Once folded, this wagon can be stored in the convenient carrying case included in your package once a purchase is made. You can now haul your favorite outdoor cart to any event or any location and set it up with ease. The MAC sports utility wagon is suitable for a myriad of activities and events, including concerts, outdoor sporting events, park trips, or for general use at home. Its denier fabric is easy and safe to clean, and it is also highly resistant to UV rays and mildew. MAC sports produces more than utility wagons. They are design experts in the manufacture of other items such as kids chairs, armchairs, director chairs, tension chairs, wagon, club and moon chairs, carts, anti-gravity loungers, hammocks, and portable instant beds. They also make all products extra exciting by making them available in a variety of colors, to suit the different personalities of their customers. 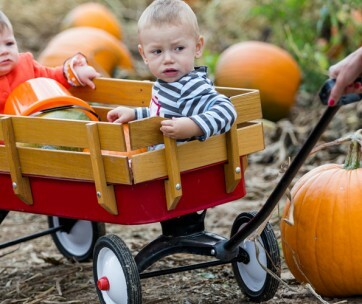 Make sure you also check our guide to the best wagons for kids. MAC Sports makes another appearance with their Mac Sports Heavy Duty All-Terrain Utility Wagon. If you’re an adventurer who enjoys extra quality time outdoors with the people you love such as family or friends, this wagon will be an excellent companion. The manufacturers of MAC sports wagons and all their outdoor furniture are themselves ‘outdoor people’, and as such, they understand the needs of their fellow members. They understand the importance of convenience and relaxation in a person’s life, and as such, design these wagons to suit those specific needs. There’s no location that the MAC Sports fold up wagon cannot be used on. It’ll be by your side while you go camping and cater for all your needs on days where you desire to go tailgating. If you need a wagon for your kid’s soccer game, this utility wagon is there for you too, cheering your kid on in its unique way. Every occasion feels different from the MAC sports all-terrain utility wagon. It is a product engineered to make it possible for everyone to enjoy the outdoors, by offering convenience, comfortability and maximum flexibility on every location and for every occasion. With a wagon such as this, there are no issues of spilled drinks or phone destruction via drowning during one of your many night fishing trips. The Mac sports wagon can be used at the lake while you’re netting your big catch. This wagon features a side table that is great for the placement of drinks. This table can be used during your picnic dates with the family. You can also make use of this wagon and its excellent side table at the beach. It’s wholly foldable and is easy to transport from one place to another. The all-terrain utility wagon from MAC Sports carries every trademark of the brand, from its design to all the features it possesses. One of such features is the design of its tires. The all-terrain utility wagon features four tires constructed from highly durable plastic. The use of plastic is to ensure that they never need to be inflated thus, one less thing to worry about for you. Many users worldwide also make mention of their appreciation for the large capacity of this utility wagon. The MAC sports utility wagon is large enough to accommodate up to 150 lbs of gear at a time. This is simply marvelous! The more significant part of this feature is that this capacity doesn’t interfere with the compact design of this wagon. The folding beach wagon from MAC Sports is not as bulky as many would expect, and it folds up smoothly into a 9.7-inch package for easy storage in the trunk of your vehicle. Besides the compact storage, heavy duty design with a large capacity and the bonus side table, this utility wagon also features two built-in cup holders for all your preferred beverages, a mobile phone holder, an adjustable handle for smooth movement and a cleanable fabric that takes off all the messes created during your various outdoor escapades. You can also become a part of the MAC Sports family, where you gain access to all the recreational equipment and furniture you’ll ever need. Be sure to also check out our list of the best popup canopy for more great items like this. There is no utility wagon design in today’s market better than the Sekey Folding Wagon. This is a multipurpose utility wagon that features an enormous capacity for all your outdoor needs. It may be used with ease as a trolley for the swift transportation of all your shopping items, or it can be used for your family trips to the park, beach or family sporting events. The Sekey wagon is approximately 7 inches in diameter and 4 inches wide. It is engineered to carry loads of up to 265 lbs, thanks to its heavy-duty steel frame design. The fabric of this beach wagon is a cleanable 600D Oxford with dual layers for extra protection. In seconds anyone can set up or install this utility wagon. It doesn’t require any assembling, and yet it can be folded easily into a package measuring 7 inches. This makes it easy to store in your carrier bag or the trunk of your car conveniently. Besides its foldable design for easy storage, the Sekey wagon comes with an adjustable handle, just like many other utility wagons, for easy transport from one location to the next. It has four extra-large tires, made from PU and designed with bearings. The bearings of these tires enable them to rotate a full 360 degrees, making them suitable for all types of terrain and road surfaces. An additional feature included in the design of this wagon is the addition of two mesh cup holders for keeping all your beverage secure during your trip. For convenient storage, the folded version of the Sekey wagon can be stored in the carrying bag provided once a purchase is made. This bag can effortlessly carry all types of gear, from shopping groceries to gardening tools and even items needed for fishing, like a tackle box. The two front wheels of the Sekey beach wagon are universal in design, and this makes them a suitable choice for all kind of occasions. The large size of their bikes makes movement on every terrain extremely easy, whether it is the beach, uneven pavements, sandy-land or grasslands. The height of the adjustable handle offered for easy transport of your wagon can be adjusted via its lock design. The ability to adapt its length makes movement easy for all kinds of people with varying heights. Once a purchase is made, a Sekey utility foldable cart is provided to users with a two years’ warranty. This versatile beach wagon with its exciting features is easily one of the best utility wagons currently being sold on the market. It is a long lasting unit that features a strong construction from durable materials. It is easy to move around, easy to store and easy to clean- everything you’ll ever need from an outdoor wagon. Are you fed up with the constant movement involved in getting your home items or garden tools from one point of your home to the other? Worry no more, as your solution is here in the form of the newly improved Seina Utility Wagon and Cart. The Seina Collapsible Beach Wagon and Cart is one of the best beach carts in the world today and it’s one we advise you to consider when searching for the perfect beach wagon for your outdoor explorations. This beach cart is merely the best; perfect for all those who are incredibly active in their homes, as well as those who love going outdoors with friends and family, this utility wagon is the epitome of versatility and cannot be compared with any other brand. The Seina wagon is constructed with both polyester fabric and a durable, powder-coated steel frame, materials that ensure that the product is long lasting. The steel used in this construction is highly resistant to corrosion and rust, while the sturdy polyester fabric used provides the longevity if the unit. 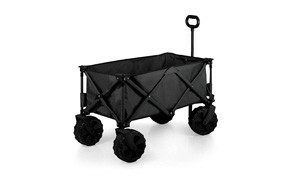 All four wheels included in the design of this collapsible wagon are made from 8 inches of heavy duty rubber and thus, are suitable for use on all terrains and road surfaces, whether they’re rocky or uneven. In addition to such robust tire features, the Seina accommodates a weight of 150 pounds and above but can be folded up for easy storage when it’s not needed. The assembling of this collapsible wagon unit is not as complicated as many would be thinking. It requires the user to unfold the wagon and then start using it; it is that simple! No extra tools or special skills are needed. This wagon can be set up by yourself, your seven-year-old son, or your seventy-year-old father. It is a family unit that appeals to all ages in both construction and use, which is incredibly amazing. Enjoy an exceptional and necessary carrying experience with the Seina wagon. Have it transport all your items from the trunk of your vehicle to the beach, your home or to the camping site where your family awaits your arrival. With the many features this wagon possesses, many people believe that the Seina is a costly unit. On the contrary, this utility wagon is very affordable and is priced reasonably. It is an innovative solution to your transport problems, and it comes highly recommended by many users from different parts of the world. A bonus feature offered is the availability of different colors for everybody. Style, durability, longevity, and function are but a few of the perks associated with the purchase of such a magnificently designed utility wagon. The Seina wagon makes for a great gift for your family, or for any loved one who keeps active around the home consistently. 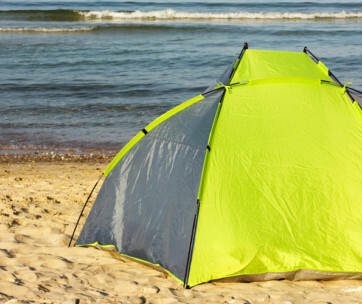 Find more great products like this by checking out our guide to the best beach tents. There’s a lot of joy in spending quality time with friends and family. Simple activities such as picnics in the park or a day out at the beach, not forgetting the annual camping trips can go a long way to strengthen your bond. All these activities require different types of gear and most often, packing and unloading them can be a challenge to your physique, especially your back. The sturdy and collapsible ONIVA Adventure Wagon is a well-engineered utility wagon, launched by its manufacturers to help save your back from imminent damage. This wagon is ideal for the hauling of all your gear, from gardening tools to beach picnic necessities and camping gear. There’s nothing that can’t be carried with this beautiful utility wagon. The adventure folding wagon from ONIVA features a steel frame construction, made from powder-coated steel. It is also made with a durable two-tone polyester canvas that can be cleaned with ease. Concerning movement and ease of transportation, the Oniva wagon is built with a telescoping handle that makes carrying an exciting activity. It also features comfortable setting up and storage, thanks to its compact design. To store this wagon freely, you can fold it and place it into its proper cover, and a unit included upon purchase. Once unfolded, the Oniva wagon accommodates up to 225 lbs of weight, and it comes fully assembled once you purchase it. Another bonus feature this adventure wagon possesses is a zippered hanging storage pocket. This pocket is located within the cart and is an ideal storage space for your tiny, delicate items such as your smartphone or house keys. The wheels of the Oniva adventure wagon are built for use on every type of terrain, even rugged grounds. They move swiftly from your car to a final destination with all your needed goods intact. Within the liner of this product is a spout for drainage, resultantly prolonging the lifespan of your wagon. The Oniva fold up wagon also features a digital print that makes it stand out from competition wherever it is used. Give your shoulders, back and hands a big break during group outings and let the Oniva wagon work for you. This wagon is a unit that is made to be durable, functional, classic in appearance and it’s also made to last. No matter where you’re headed or the type of gear you need to haul, you can rest assured that your latest companion, the Oniva adventure wagon, will be with you every step of the way, acting like your sidekick and courier. This utility wagon makes for an excellent gift for a family that loves to engage in outdoor activities or family trips. It is also ideal for people who move around a lot in their home, participating in activities such as gardening and cleaning. So put on your swimming trunks and hit the beach. When we talk about the quality of a product, the convenience in use and excellent customer service, one brand tops the charts; Impact Canopy. All products manufactured by the Impact Canopy company surpass other manufacturers thanks to their consistent use of some of the best production practices in their industry. They aim to provide all customers with stronger products with better quality, at a higher value than their competition. This is done via the constant improvement and upgrading of their manufacturing technologies. Only high-quality products are launched into the market by Impact Canopy, with some of these products being pop up tents, canopies, banners, chairs, phone booths, utility carts, accessories, and even beach wagon. Each product offers users with a glimpse of the ‘Next Level’ of innovation, technology, design, product support and of course, customer service. The Impact Canopy Utility Wagon is another foldable unit that comes highly recommended by our team and thousands of users around the world. 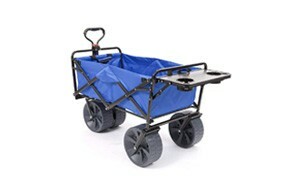 With many positive reviews about this product, no doubt is one of the best beach wagons in the history of beach wagons. It is the perfect transporter of all your gear, as it makes the process of packing, moving and unpacking comfortable and convenient. This large utility wagon can be used for light off-roading trips to the beach or your campsite whenever you please since its tires have been engineered for use on every type of terrain and road. These tough wheels are made from polyurethane foam, highly durable and long-lasting material. The wagon’s construction makes use of a sturdy steel framing system and a wagon fabric for easy storage. The steel frame used enables the Impact canopy wagon to carry loads of up to 175 pounds with no issues. The bucket of this utility wagon is built with an extra-large capacity from a 600 denier Oxford material that prolongs the lifespan of the entire cart. All technologies used by Impact Canopy for the manufacture of such a fantastic utility wagon ensure that this collapsible wagon is durable enough to withstand all weather conditions, no matter how adverse, and also to provide many years of use to their owners, through their high standard of construction. Prepare for your next big trip with the Impact Canopy utility wagon as your packing assistant and enjoy many trips to the beach, sporting events, camping sites, gardens, outdoor concerts and even quick grocery runs. The Impact Canopy utility wagon comes highly recommended by many users in various parts of the world. With significant appreciation being for its extra-large capacity and also its affordability, there is no doubt that this unit is an extremely budget-friendly wagon that speaks to the pockets of everyone. The Goplus Wagon Cart is the last, but not the last item on our list of recommendations for the best beach wagon. If you need an exceptional product that will make your next camping, sporting, shopping or beach trip enjoyable, stress-free and backache-free, we suggest that you invest in the Goplus wagon. No matter the kind of event you’re going for, this utility wagon is engineered by professionals who love the outdoors just like you. They know exactly what you need, concerning comfort and relaxation during your outdoor trip and as such, they create the perfect solution for you. There’s nothing this folding cart cannot carry, from your garden tools to groceries and even camping gear, this wagon from Goplus will move it with ease. The Goplus collapsible wagon features an adjustable telescoping handle, with four large oversized wheels. These two unique features enable the unit to transport all your gear with little to no extra effort needed. The front wheels of the Goplus cart can be rotated a full 360 degrees, while the back wheels maintain their stance to deliver excellent stability on various terrains. Using this wagon cart of folding it away for storage is quick and easy, taking up only seconds of your time. Once unfolded, the Goplus features a hefty weight capacity of 150 lbs, and this is large enough to suit all types of gear you may want to store. Unlike many carts review above, your children can benefit from a ride in the Goplus beach cart! They are even provided with an extra removable canopy that delivers complete shade while they enjoy a great trip with their toys or pets. 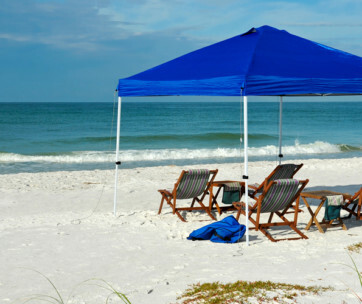 The bonus canopy is engineered to fight off harmful UV rays while being highly resistant to water. There are additional features possessed by the Goplus fold up wagon that make it an enjoyable product. Some of these features include a carry size bag for the folded version of your utility cart, a detachable front pocket that can be used as an extra storage space for delicate and handy items, and an amazingly reasonable price tag. Have unlimited fun wherever you please, with no worries regarding the process of packing up at the end of the day. That is why the Goplus wagon is around; it is your personally designed open-air trolley, utility garden cart, shopping push bar, and wagon cart all in one, not forgetting your kid’s next favorite transport mode. Don’t hesitate to get one for your home, for friends, family, and anyone you know who can’t get enough of the outdoors! If you need a smaller bag for your stuff, check out our guide to the best beach bags. Price - Generally, it doesn't cost a fortune to own a cart or wagon. Also, low rates of beach wagons don't make them low-quality products. With the belief that customers pay for the quality they receive, all the products selected by our team are some of the most reasonably priced units that every budget can afford, thanks to the time taken by brands to find a balance between materials and price. Durability - With the many trips you're yet to plan, your beach wagon must last you a long time. In curating a list of recommendations for readers, the durability of several beach wagons was considered, with regards to the materials used and the form of construction used. The products selected don't require constant repairs, which will cost you more than you bargained for. Durable construction materials such as aluminum and metal were considered more durable, as compared to plastic. Portability - With the main aim of a utility wagon being the movement of gear, people or food across locations, another factor that was at the top of our priority list while hunting for the best beach wagon was portability. The brands included in our list produce utility wagons that can be moved from one location to the other with ease, even when they're fully loaded. They are lightweight units when empty and feature rigid frames that can be collapsed when it's time for storage. Accessories - The existence of competition in the beach wagon market has led many manufacturers to create distinct designs with additional features that will draw in more consumers. Examples of these accessories are side tables, umbrella holders, coolers, cup holders, utility trays, cell phone holders and the ability to hold up to six beach chairs at any given time. These design advancements made the selection of the best extremely easy since we love to provide elements of surprise to our readers. Terrain - All our favorite beach wagons are great for every kind of ground, from the sandy beaches to rugged grounds. In choosing, we analyzed the strength and size of their tires, as well as the materials they were made from. Material - Materials are essential for the performance and durability of any product, beach wagons included. Once the material of the cart is of poor quality, the units’ productivity becomes redundant. Our team of analysts and researchers hunted down all products that showcased high resistance to tear, were lightweight and also super durable. Also, the materials used in constructing our recommended beach wagons are easy to clean in the event of a drink spillage. Knowing what features to look for in your next beach wagon is incredibly important as this will help you get the best deal possible. Some key features have been listed below to help you make the right purchase. Frame - The frame of a utility wagon is one of its most essential parts. Poor design of the structure can cause your cart to bend and break when under a little pressure. When making a choice, you must consider the location you're most likely to frequent with it, to select one with materials that won't deteriorate over time. Weight - A beach wagon must not be bulky or heavy when empty, even though its meant carry tonnes worth of items. Lighter carts are easier to fold for storage, while more heavy beach wagons are harder to maneuverer and fold for storage. Wheels - The wheels of your utility cart must be large enough to provide stability on all types of terrain. Small tires tend to sink when used in areas such as sandy beaches. Most quality wagons feature plastic tires that have extra traction and an extremely wide stance. These features low for natural movement of your cart on any kinds of terrain even while fully loaded. Assembly - The process of installation for all beach wagons must be straightforward. The process must not take a lot of time to undertake and should involve necessary actions such as attaching a handle or putting wheels on the cart. Beach Cart or Wagon? - Both the beach wagon and beach cart are ideal for easy transport of food, gear, and tools from one location to another. There are some differences between the two. Generally, beach carts are taller with smaller wheels, and also feature taller handles and a smaller footprint than that a wagon. Beach wagons aren't characterized by an enclosed space like the beach carts. They feature a longer body and are generally lower to the ground, with an open area for better access to all your items. The handle of the beach wagon requires pulling due to their more protracted nature. Storage Space - The available storage space of a beach wagon or cart is the primary reason for its purchase. Look out for carts that can accommodate all your gear. If possible, go for models that provide loads of pockets for extra storage. You should also think about how your wagon will be stored when it's not in use. The ability of a wagon to be folded makes its storage easier and much more appealing. If your cart is easy to store, you're more likely to keep it for a long time.